The Nevada Union girls team impressed with a third place finish in the Division III race. With the top-three finish, the Lady Miners secured a spot at the CIF State Championship Meet Nov. 25 in Fresno. This is the first time in 13 years that NU has taken a girls team to the state meet. 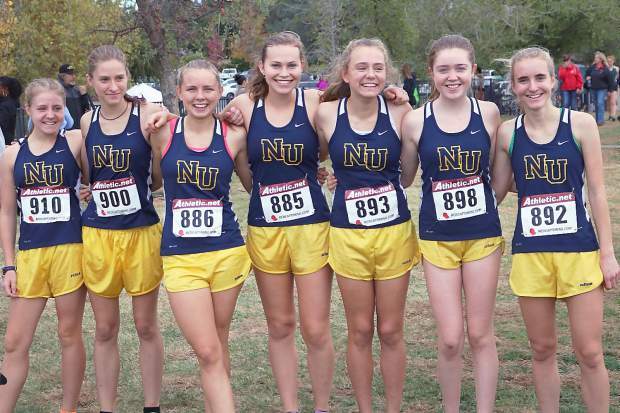 The Nevada Union cross country team headed to the notorious Willow Hills Reservoir course at Folsom High School Friday to compete with the best harriers in the region at the Sac-Joaquin Section Championships. The 5K course travels through the rolling hills on the outskirts of the Folsom campus while circling the vast lake right in the center of the park. The sun was sheltered as the clouds were expansive forms covering the sky and providing ideal conditions for the commencement of the most important race of the season. The Lady Miners were led by senior Anya Cooper-Hynell with a seventh place finish and a personal best time of 19 minutes, 32.6 seconds at the Willow Hills course. Next to cross the finish line for NU was junior Sheriane Greene (20:25.8) in 16th, Selah-Marie Grogan (20:42.3) in 22nd, Sophia Lehmar (20:48.5) in 25th, Mackenzie Morgan (21:00.4) in 28th and Claire Berman (22:41.7) in 55th. Vista Del Lago senior Sydnee Kizziar won the race in a time of 19:02.1. Nevada Union boys runner Garret Gough was victorious in the D-III varsity boys race, finishing in a time of 16:05.6, and besting the next competitor by 24.7 seconds. Gough’s performance secured him a ticket to the state meet as an individual. Junior Decker Krogh was next for the NU boys team, finishing in 14th with a time of 17:18.5. Rounding out the varsity boys was freshman Jake Slade (17:34.0) in 20th, Travis Selby (17:50.6) in 33rd, Josh Ross (18:04.7) in 45th, and Wyatt Gough (18:09.7) in 46th. The boys team was just five points away from advancing to the state meet, finishing with 102 points and in fourth place among D-III teams. The winning team of Vista Del Lago scored a collective 83 points to secure the victory. Stand out performances at the Section championship meet also included NU’s Antonio Valenti who won the D-III freshman race on the 2.1 mile course in a time of 11:50.5, and Cole Barton who finished sixth in the sophomore boys race in a time of (12:05.3).